I had a post prepared, but a whisper woke me up this morning, much earlier than I normally climb out of bed, with something else. I don’t know what you face today, what you ended your day with yesterday…what your week has held for you this far, or what you’ll have to endure tomorrow. I’m over at Living By Grace, our fb community page. Come by and join in the discussion! First, I want to let you know I’m so doing a dance right now for my friend Jodie Bailey, who just signed a contract with Steeple Hill! Yay for debut novels! I’m so excited! Go by and congratulate her! Now, on with the show this is it! I loved this small piece of dialogue in Attracted to Fire by DiAnn Mills. It leaves you with a sense of doom approaching and the possibility of not being strong enough to fight off the evil. Agent Meghan Connors and Agent Ash Zinders are tossed together to protect the Vice President’s alcoholic and drug addicted daughter when threats are made on her life, but Ash doesn’t like female agents and Meghan resents it almost as much as she’s determined to prove her worth. To add more conflict, they both want the same promotion. Eeek! I enjoyed this romantic suspense. Her characters were believable, real, and courageous, but not invincible. When it came to personal relationships, they were vulnerable, timid, and frightened. I happen to love reading books about flawed characters. I love watching and journeying with them as they grow and mature. And I love books filled with danger! If you do too, you’ll want to pick this one up! DiAnn subtly weaved renewed faith, healing, and trust in God into an action packed book without being preachy or obvious. *Thanks to Tyndale for letting me review this book in exchange for my honest opinion. I gave Attracted to Fire 3 out of 5 stars! Fall is here! What is your favorite thing about the season? Morning, everyone! Welcome David N. Walker! If you need some encouragement or want to feel like you matter, get to know David. He’s great at both! I was honored to be his very first guest blogger a couple of months ago. He does a series called memorable moments, all of them are touching. Today he’s talking about hope and that’s it’s never too late to give it up. I agree! Not all memorable moments are happy ones. Some are forever burned in our hearts as tragic, as this one is from David. David, thanks for sharing such a deep and personal experience in your family! The call came in early on an October morning. I was scheduled to drive to southeast Texas that day to visit my daughter and son-in-law and two-year old grandson, and it took me a moment to realize my sister was calling. I couldn’t imagine why she would call me at that hour of the morning, but I knew it wouldn’t be good news. In the 51 years I’d known her, I’d never heard so much anguish in my Barb’s voice. She told me her daughter Donna, her oldest child, had disappeared and that she suspected she’d gone somewhere to commit suicide. I don’t remember much more about the conversation except that she told me she’d call back as soon as they either found Donna or her body. I never got back to sleep that morning. I didn’t know whether to proceed with my trip—which included several business calls also—or to cancel and stay by the phone. I decided to go on. The business calls needed to be made, and if I needed to make and emergency trip to Montana for a funeral, Lynn would want to go with me, so I might as well be at her house if that call came. We’d had a family reunion in the mountains behind Ogden, Utah, that summer, and I thought back to Donna’s behavior at that time. Normally a very sunny person—or so I thought—she was moody and kept to herself the whole time we were there. I thought she was being rude at the time, but it was so foreign to her normal behavior I didn’t fuss at her about it. My mind wandered back to happier times with her. She was my parents’ first grandchild, born my senior year in high school. We all doted on her. When my sister and brother-in-law took Donna and left Fort Worth to move to Billings, Montana, I felt like I was losing a piece of myself. Finances and distance kept my visits with them to a minimum while Donna was growing up. When they adopted their other three kids—all at once—they came back to introduce them to various family members. I was in OCS at Fort Sill at the time, and I got permission to visit them in the company dayroom for one hour—the first time I’d seen Donna since they moved. We went to visit them in Three Forks, Montana, where they’d moved a year or two earlier, when Donna was nine. Then I was up there twice the summer she was 13. I think that’s when she and I began to develop a real bond. She hated having to wear glasses, and I bought her the contact lenses her parents couldn’t afford on a small-town pastor’s salary. At the time she got married, my finances and my domestic situation prevented me from attending her wedding. I always regretted that. She and my sister Barb came to Texas to show us her first-born daughter Ashly, and I spent Christmas at Barb’s when Donna’s second daughter Kelsy was a few weeks old. She brought her whole family to Texas for Lynn’s wedding, and Ashly served as a beautiful flower girl. The importance of their participation made me regret all over again not attending Donna’s wedding. By the time we made our next visit to see Donna, she was raising her sister’s daughter Brittany as well as her own two. This was the family she’d be leaving behind if indeed she’d taken her own life. Barb and I talked several times over the next couple of days while I was on my business trip/visit. Lynn and I were visiting in her den on Wednesday afternoon when Barb called to tell us the sheriff’s office had found Donna’s body. We called Lynn’s husband Gary to come home and take care of Austen, the grandson, while Lynn went with me. We drove back to Fort Worth, where I quickly arranged for my wife Sharon, Lynn, my sister Kay and her son David to fly to Missoula for the funeral. We left Thursday morning, arriving in Missoula sometime that afternoon. We spent most of that day and the next sitting at Donna’s kitchen table visiting with the three girls, Donna’s husband Dana (the girls’ father), and an uncle and two aunts on her father, Charlie’s, side. Barb and her husband Jack, and Charlie and his wife Carol were with us part of the time and out making funeral arrangements part of the time. Through all the hushed conversation I couldn’t keep my mind off the great surprise and horrible tragedy. I suppose if a person gets depressed enough suicide can seem like the only answer, but it never solves anything. It just complicates everyone else’s lives. Donna’s best friend Coco took us up into the mountains to the site where Donna took her life. She’d parked her car, run a hose from the exhaust pipe through a cracked window and sat there waiting to die. What an abomination. Although all three girls are now grown, responsible women—all three happily married and two with families of their own—they all went through hell getting there. Life became so unbearable for them that each one left home to live elsewhere while finishing high school. My niece has been gone for 17 years now, but I still miss her terribly. After all these years, it still doesn’t take too much to bring tears to my sister’s eyes thinking about her. Our entire family suffered great pain from this, and her three girls suffered the most. If you’re now contemplating—or ever have contemplated—committing suicide, DON’T. It’s not just your life. Think of all those around you who would be crushed by it. Depression may make you think you’re of no importance to anyone, but YOU ARE. If you have a close friend or relative who’s been touched by a recent suicide—or even one long ago—hug that person and realize he or she is suffering a pain that never quite goes away. It will fade with time, but it will always be there. I’d like to add this scripture, David, if I could. David N. Walker is a Christian father and grandfather and a grounded pilot. He co-founded Warrior Writers Boot Camp with Kristen Lamb. You can read more of his posts HERE or follow him on twitter. Good morning! For those of you going to ACFW this week, have a wonderful time. Be encouraged and better yet, encourage someone else! Come over to Living by Grace today. We’ll be chatting about the post. Last week, my seven-year old son hopped in the van with news all moms like to hear. He read a few pages aloud and then read “in his head” as he likes to call it. When we got home, he read a few more pages to me as homework. It all sounded fine. I tucked him into bed, kissed him goodnight, and went to my room. About ten minutes later, I heard him holler for my daughter. It didn’t take a second before she was in my room. “What’s the book about?” I asked again. I left the room and pulled the book out of his backpack. Long story short, too late, he begged even the next morning to read that book. Even if I hid the cover, the story was about a girl who wanted to pretend to kill herself because she was hated and what happened was, a ghost stalked her and wanted to be her friend forever! Ick! We fight God for things we know aren’t good for us, but we like. To me, that book was silly. Why argue about it? But it wasn’t even a few years ago, I didn’t want to give up a particular TV show He was nudging me to. I whined. I begged. I stopped watching the show, but each Sunday night, I’d read the guide on the TV to keep up! Just like putting construction paper over the book. God knows what’s best for us. He’s our Father. He’ll nudge us, explain to us, and if we’re still pretty stubborn, He’ll flat out get stern if necessary, but He does it out of love. With this in mind, stop arguing with God. Simply let Him help guide you to bear more fruit! Have you ever struggled with giving something up you know is not good for you? You don’t have to tell in detail what it was, but share how you handled it! If you could mix cotton candy, an apple, and glitter together, you’d get Lacie Nezbeth! She’s sweet, sparkly, fun and good for you! I’m so excited to have her today. Lacie Nezbeth is a stay-at-home mom with three young children. She spends her time running them all over town and loving it. Her love of books and history began when she read Little House on the Prairie as a young girl. 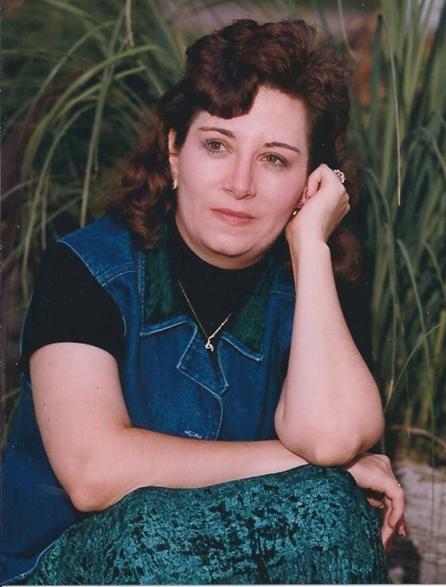 Since then “the good ole days” have fascinated her and made her writing genre an easy choice! She loves to live “in the moment” with her family and enjoys traveling, shopping and baking decadent desserts…which doesn’t bode well for her shopping! When did you get the writer’s bug? Has it always been something in you? Did you pen your first story with a jumbo crayon? Nope. No jumbo crayon works of art for me. Although, I did write a short story in the 4th grade that I was pretty proud of. Got an A+ and everything but that’s as far as writing went for me as a child. I first got the writer’s bug when I was pregnant with my first child, back in 2004. I was stuck at home a lot due to the constant retching that plagued me daily for my first trimester. Reading was the only thing that kept me from cursing motherhood altogether. One particularly rough morning, after I finished reading an especially frustrating book, I said, “I’m gonna write my own book. One without all those stupid problems that keep the heroine and hero apart for so darn long.” That tells you how much I knew about what I was getting into. J But the idea stuck and I’ve enjoyed learning more and more about how great books come to be. We do ache to have them together quickly don’t we? It’s fun keeping them apart as the writer, though! Yum! Speaking of yum, do you snack while writing? If so, what do you munch on? No. I’ve found that when the words are ready in my head, trying to eat and type at the same time just slows me down. Apparently, I’m not a very good multi-tasker. But when I’m stuck somewhere in my story, bring on the food! Something sweet and chocolatey…if I can find it. Bake one of those decadent desserts, then call me over! What do you love most about writing? What do you find most challenging? My favorite thing about writing is getting lost in my stories. For me (since I write historicals) it’s fun to imagine what it must have been like to live without all the modern conveniences that we all love. I’m constantly wondering if I would have survived. I like to think so. Finding time to write or being consistent in my writing is the hardest thing for me. When I have 37 other things I know I need to do, I sometimes feel guilty taking the time for myself. And then there are those days when I’ve hit a road block in my story anyway, so those 37 other things can also look pretty good. 37 things? Really? That’s all? You need to be busier. 😉 How do you come up with story ideas? This is one area where I don’t struggle at all. Thankfully! A new idea will randomly sneak into my head…usually while I’m driving or researching. I keep a running list of book/plot ideas on Evernote. Some really need to be fleshed out and others are ready to go. I just can’t write fast enough. I have tons of ideas while researching and driving too! We’re twins! If you could be one hero/heroine from a book who would you choose and why? LOL! Yeah, bosom buddies is a tad frightening! If you could be one villain from a book who would you choose and why? I’m using “villain” loosely here because personally, I don’t think she is one, but Scarlett O’Hara from Gone With the Wind would be my choice. Man, that woman had some nerve and determination like I’ve never seen. Her methods were a bit…let’s say…skewed. But her motivations of protecting her family and land were very noble. She happens to be one of my favorite characters. I could go on and on, but “I’ll have to think about that another day.” (Hand over forehead as if I might pass out.) So, what are you currently working on? Tell us a little about it. Prairie Breeze is a mail-order bride story gone terribly wrong. Victoria Sutton impulsively accepts an advertisement to marry Benjamin Black, who is headed west to Oregon Territory. Only Benjamin has no interest in marriage whatsoever and is clueless to the marital ad his well-meaning father placed in his name. When the two meet, naïve to the others’ identity, sparks fly. But not just the good kind. Is there a question you’d like to ask everyone? I, personally, love to thrift shop and I find all sorts of divalicious designs for penny prices! Well that’s my two cents…get it…two cents…;) I’ll stop now. You can connect with Lacie on twitter, facebook and her blog! You can…and you really should! Today, I’d like to welcome Staci Stallings to my blog. Say hey, everyone! 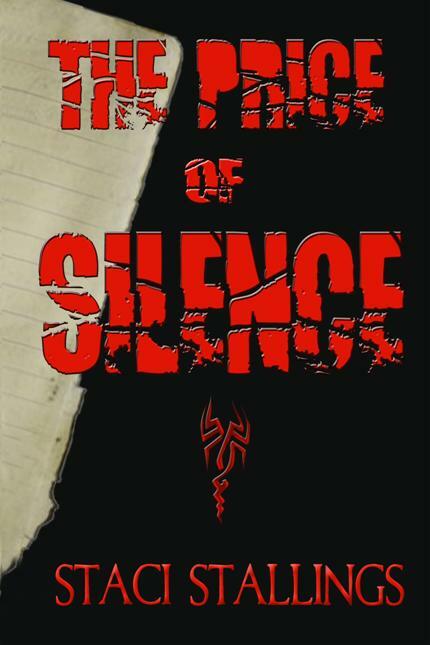 Staci is the author of the book The Price of Silence. Take it away, Staci, and thanks for blogging here today! One of the most difficult things about being a mom is walking your children through life’s really tough lessons. You can be floating along just fine, never even seeing the storm clouds gathering, when suddenly you’re caught in a maelstrom. That’s what happened the other day with my son. Now he’s eight and very soft-hearted. He makes it a point to be nice to everyone (other than, of course, his two sisters). He takes things in very deeply. No surface living for him! He’s also highly creative and he wants to be acknowledged for the good ideas he comes up with. Sometimes that’s a challenge in second grade. Okay, it doesn’t get any easier after second grade either, but we’ll deal with that later. So the other day he gets in the van after school. I asked how his day was, and he said, “Bad.” Now he has “April Fooled” me numerous times coming back with “not really it was great!” But not this time. No, this time, bad went from bad to really bad to absolutely horrible in a matter of a heartbeat. By now big crocodile tears were rolling down his little cheeks. You really can’t make this stuff up, you know? That’s when I realized he was really going to need some help getting through this. It wasn’t just a thing he was going to get through. He wouldn’t forget it in five minutes. This was real to him. He was angry and hurt, and carrying that around wasn’t going to do anyone any good. About this time the tears stopped, and I could see peace come over him. “Just think about it,” I said. You know, forgiving is hard. And the worse whatever the other person did, the harder it is to forgive. But when it’s right and you know it’s right but it’s hard, that’s when you know you need God. God is there to help you and guide you through those rough patches when you really don’t want to do the right thing, when doing the wrong thing sure sounds easier and more logical. But God’s logical will help you find real peace. The other is just a long road of misery. By the time we got home that night, my son was in much better spirits and the next day he not only signed the big card, he included his little card with it. So maybe he learned a good lesson. I know I did. Thanks, Staci! I’ve learned many lessons from my kids. I’m thankful He’s there to guide me through things I don’t really want to do. When I obey, the peace truly is sweet! And… Staci’s website Go visit! On Monday, come back to meet my special friend, writer Lacie Nezbeth! Hello, everyone! So glad you’re here! Let’s jump in and I hope and pray you’ll be encouraged today! And don’t forget we’re talking about endless possiblities over at Living by Grace, on facebook! 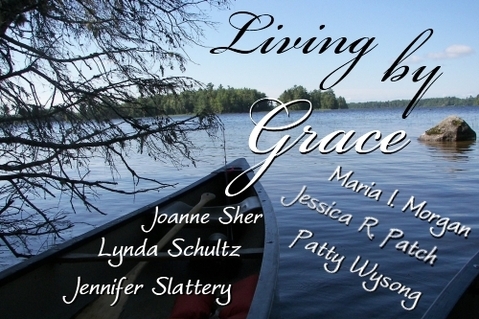 You can be a part by clicking the Living by Grace “like” button on the sidebar! I’m still studying Joshua. A fascinating book, really. Like all the books of the Bible. Full of treasure. Everything that makes a wonderful book–only all true! Today’s text is found in Joshua 22:5. “…hold fast to Him…” This small phrase is going to lead us somewhere else! What does it mean to “hold fast,” and how do you do it? In Genesis 2:23-25, God joins Adam and Eve. “to be joined to his wife” is the same word used here in Joshua. Marriage is a union of two people– making a covenant to join together, to stick closely, cling to each other—for better or worse, in good times and bad, in sickness and health, richer or poorer. No matter what. This is how God feels about us. When we accept Jesus as our Savior we enter into a covenant with Him. We join ourselves. We hold fast—cleave—stay close. Hosea 2:16 is an example of God seeing us as His bride. An unfaithful bride that has ran after other lovers. Anything or anyone you put before God is another lover. Because you’re joined to God. But He’s a loving husband. Always wooing us back to Him. In Matthew 9:15, Jesus refers to Himself as the Bridegroom. His love for us…sacrificial. Song of Solomon is a beautiful picture of how the Lord loves us. The imagery is captivating, the story breathless from beginning to end. It’s my favorite book. A book that tells of a bride who must learn complete surrender to her lover husband. A husband who desires a bride who will go with him wherever he asks her to go, even if she’s frightened or insecure. To him, she’s the most beautiful thing he’s ever laid eyes on. He wants to show her a whole new world. It just so happens to take place in a wilderness. Imagine a wilderness. A wild, uninhabited, and uncultivated land. I see it as dry; every breath zaps the moisture from your tongue and the grit from the sand scratches at your throat. Parched. Barren of anything lush or green. The heat leaves your clothing clinging to you until the sun scorches even the moisture of sweat away, and then it’s just a stiff feeling, like hanging clothes out and not using any fabric softeners. But not for the bride when she’s with the Bridegroom—her Beloved. He makes streams in the desert, waters that gush in the wilderness. She won’t become thirsty and there’s enough to share with others. Will you go with Him? Will you step out of your comfort zone and let Him show you things you cannot even imagine? Glorious things. A diamond sky. Don’t you dare close your eyes! Surrender. You can say yes. You can go deeper. Not only does she come out of the wilderness, but she comes out safely—closer to her Beloved than ever before. Leaning on Him for strength. He’s protected her from the elements, the dangers, and from her own doubt. His love is stronger than death…stronger than hell…stronger than the grave. He hurdled mountains and skipped hills for you–the huge problems and yes, even the small things because He cares about them all. He wants to show you intimacy like you’ve never experienced before. A whole new world. Now watch the video, but this time…put yourself in Jasmine’s place and see Aladdin as Jesus. Stretch your imagination and see what God shows you! GREAT NEWS Kutless Style & Tips For Writing Conferences!!! In 2004, I wrote my first novel. I wrote it under a pen name and I didn’t write it for the glory of God. Everybody falls sometimes, Gotta find the strength to rise, out of the ashes and make a new beginning. In August of 2008, I had a conversation with God and I started writing again. I finished my first novel, under my name, for the glory of God, in December 2008. I wasn’t sure what to do with it. I had never read a blog or a craft book. I read it for typos, but that’s about all. So, I decided to put it on Christian Manuscript submissions. While it sat there, I wrote another novel, and another and then I put a new one on the same site. During that six months, I wrote a few more. In March of 2010, I wrote a new novel and submitted it in the Operation First Novel contest. I didn’t semi-final. I made a decision to fly to Denver for the Writing for the Soul conference anyway. My husband is my rock. (Yeah, Jesus is, but you know what I mean) We were going to go together. I’m terrified of new places and going into unfamiliar territory alone. Not just apprehensive, terrified–but hubby was going. Until he wasn’t. “Jess, I can’t go. I’m swamped at work (not just busy but lots of stuff).” His face expressed concern. He knows I depend on him to get me places. Anyone can feel the ache, You think it’s more than you can take. But you’re stronger, stronger than you know. A few days later, he booked a direct flight so I wouldn’t have to worry about layovers and he made sure I knew about the shuttle counter and how to get a ticket. In February 2011, I got on a plane in Memphis, alone. Except, I wasn’t. “You’re crossing your Jordan, Jess. Just you and Me,” God whispered. I cried on the plane. I was flying towards my promise. I had taken the step of faith. I looked out the windows. I was doing this. Me! Little ole’ me. And Big Ole’ God. Don’t you give up now, the sun will soon be shining, You gotta face the clouds, to find the silver lining. I landed in Denver airport and met up with one of my Critique partners I’d made online during the few months before the contest. Where was she before I entered? I had spent a lot of time in prayer. I read the blogs and articles about how hard it was to break out into the publishing world. But I had a God-given dream. I had to decide to persevere, when my heart failed, when my mind said NO WAY, when I thought about who I was–a nobody from a small town, when I cried alone at the thought of pitching to an agent or editor, when I needed the money to get to the conference. When I looked at all the reasons why this was ridiculous. I kept writing. I kept believing. I had to. It doesn’t matter what you’ve heard, impossible is not a word. It’s just a reason, for someone not to try. Everybody’s scared to death, when they decide to take that step…out on the water, it’ll be alright. I didn’t know what to expect. But I’d prayed and believed as I searched the available agents and editors attending the conference that God would guide me to the right ones. Maybe nothing would happen at that moment, but for the future. “God, who is right for me? I don’t want to pitch to everyone. I don’t want to scramble and rush. I want the right ones. For me. That’s my prayer. Have Your way.” TIP: Be prayerful about pitching and querying. I signed up for mentoring, then I signed up for the coaching and then I got all 3 of my prayerful picks. One publisher, one editor, one agent. Later that day, I sat in on a 15 minute coaching session. I slouch. I know. It was a great coaching session. Talk slower, relax. You’ll be fine. Sounds like a neat story. I pitched to the publisher first. She asked me what my story was about and had I written any other ones. I told her. “I like the story, but we do more missional novels. I’m interested in what others say, if you get a chance tonight, come find me and let me know how it went. Can I pray for you?” Tip: Editors, Publishers, and Agents are people. Relax. Easier said than done, I know. But they really do want the best for you! Life is so much more, than what your eyes are seeing, you will find your way, if you keep believing. I pitched to an editor next. I was intimidated, but she smiled and asked me some questions. Hard ones. She asked me, (TIP:) “Why did you write the book?” “Why do you think this book should be published?” I had answers. My first funny one was, “I’m pitching this one because it isn’t my first book.” We laughed. Then I told her the real reason why. She asked for a partial. And then, it was time to pitch to THE AGENT. The ONE. I walked in and shook her hand and introduced myself. “I know your name. Do you follow our blog?” TIP: Comment on agent blogs and be sincere. “Yes, I do.” And then my nerves got me, but I gave her my elevator pitch. “You know I’m going to need more than that now.” She grinned. TIP: Be able to explain your book further than one hook-pitch clearly and quickly. I left, went straight to my hotel room, crumpled into a heap and bawled. A partial and a full. It was hope. It wasn’t a contract, but it was hope. Slim. But hope. I sent the requested material March of 2011. The second week of June I received an email from the agent. She enjoyed the story and felt it was almost ready for representation. She made a list of a few areas that needed revised. 1. Too many POVs, I cut out 3 because she was right, they were there for convenience. YES! I’ll do all of it. I printed out the ms and prayed. Please help me to do this, Lord. After I tackled the big issues, I went through and polished it. Then I sent it to my critique partners. They all caught something! They were life lines. TIP: Get critique partners you trust and polish your ms before sending. On June 8th, 2011, I sent my revisions. August came and I read a blog by another agent saying after a couple months it’s ok to send a nudge and see if the agent has received the material. So I did. I sent an email asking if she had received what I sent. I got a reply. Yes, she had and she was half-way through it, with an apology for taking so long. How sweet was she? Okay, that’s better than I’m half-way through and not reading any more. I can wait. I can do this. On September 9th, I received an email with a date to discuss representation! That call came this past Wednesday. I had a great conversation, we’re on the same page, and we’re excited about what’s to come! 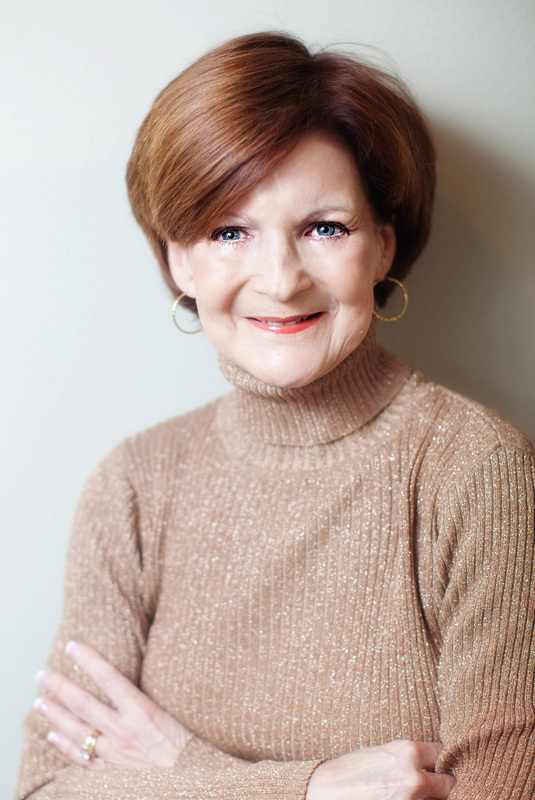 I am honored to be represented by Rachel Kent of Books & Such Literary Agency! If you’re writing or whatever your dream is– keep believing, keep dreaming, keep moving forward. Have faith. Even if you fall sometimes, you will have the strength to rise. Posted in UncategorizedTagged Books and Such Literary Agency, jessica r patch, Rachel Kent, tips for writing conferences, writing49 Comments on GREAT NEWS Kutless Style & Tips For Writing Conferences!!! Okay, First of all, I had a friend bring to my attention that I had not set up my facebook writer page button correctly on my sidebar. So if you clicked it, you like facebook platform! Oy, so now it’s fixed! If you want to take a second and “like” me, I’d love for you to! And you’ll really and truly be liking ME! My brother and I are 2 years apart, me being the oldest…wisest…smartest…the list goes on. 5. Ignored him and called it “shining.” He would holler, “Mom, Jessica and Celeste are shining on me.” Since my mom had no idea what that was, we never got in trouble. Most nights he went to bed crying. Yeah, yeah, boo hoo. 4. When Mom and Dad were gone, I’d throw steak knives at his door so he wouldn’t come out. He still tells on me for that, twenty years later. I like to call that, overkill. 3. Left him in the road half dead when our psycho Doberman ran out in front of him on his bike. He flipped head over the handle bars. I was too busy laughing hysterically in the yard with the neighbor. He survived. Barely. He had a concussion. I might’ve peed a little. 2. To get out of washing dishes, because the psycho Doberman ate the dishwasher, no it did, I would holler, cry, and yell at him, (he was drying) to stop hitting me. My mom would scream, “Jared! Knock it off!” He would plead, “I’m not doing it! She’s lying.” Why would I make that up? 😉 And then, my dad would make him wash and dry. Alone. I could only get away with this about once a week to keep it believable. 1. I dressed him up in Holly Hobby nightgowns, painted his nails, and made him have tea parties. We have pictures as proof. Love you, Bro! No, really. I do. What mean things did you do to your sibling/s? Have a great weekend! AND… I have some BIG BIG BIG news! Coming Soon! I hope everyone had a great holiday! Cookouts, staying in jammies longer, poolside. Fall is on the way. No more white shoes or pants. Black’s more slimming anyway. What does living by grace mean to you? For me, it means walking each day knowing I am weak, but He is strong. I get tired, He never does. I stumble, He holds me up. I make mistakes, He’s perfect. So many things pour into me every day. Responsibilities of being a wife, mother, employee, a writer, a woman (if you’re a woman you know what I’m saying). I wear many hats. I love each one. I love each responsibility, but they can all wear me out. I need my thirsty soul, quenched. I need saturated with His love, with the washing of the water of His Word. I can’t be good at any of the things above, if I don’t first fill myself up with Him. And because I’m a woman, I like to share. Women love to share, don’t they? My husband is amazed at some of the things I’m willing to divulge to my girlfriends. I love it when a bunch of us get together and talk about life and most importantly the foundation of life. Jesus Christ. It renews me, encourages me, revs me up, and gives me hope. We bond through friendship and faith. We care for each other, pray for each other, laugh together. It’s a wonderful experience, especially when coffee and chocolate are involved! Doesn’t this sense of belonging, renewal, and friendship sound wonderful? Wish you could have it on a daily basis? I’m honored to be partnering with some incredible women of faith who want to live by grace, together. We want a sense of community and camaraderie with other women. On September 12th, we’ll be launching a devotional facebook community. Living By Grace. We want to invite you to come by and let your souls be quenched, your minds and hearts challenged. Each day an amazing woman will bring the word through a devotional and feel free to mingle, chat, ask questions, and just have a good time. We’re building bonds of sisterhood through faith and facebook! Come and join us. “Like” our page by clicking the button on my sidebar and grab our button for your blog if you’d like! I’m honored to be working with such talented writers. They all have wonderful personal blogs. You can find them by clicking on their names below. Posted in UncategorizedTagged #devotions, facebook, jessica r patch, living by grace, writing14 Comments on Who Doesn’t Get Thirsty?